Edward Harrison Reynolds, 95, of Wakefield died peacefully at the Bear Hill Nursing Center on Friday, June 6th. Born in Stoneham, on June 20, 1918, he was the son of the late William A. Reynolds and Mildred D. (Kemp) Reynolds and the stepson of the late Elma E. (Cutter) Reynolds. Mr. Reynolds was raised in Wakefield and was a graduate of the Wakefield High School, class of 1936. 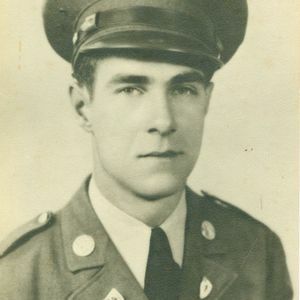 He had served in the U.S Army during WWII with the 182nd Infantry, Americal Division. He was the recipient of The Purple Heart, The Bronze Star, and two Presidential Citations for gallantry and wounds suffered during the Guadalcanal and Solomon Island conflicts in the South Pacific. He had worked for the L.B Evans Shoe Company in Wakefield and was a producer of traditional jazz records under his own label Harrison Records and the traditional jazz label, Stomp Off Records. Mr. Reynolds was the husband of the late Jennie (Christopher) Reynolds. He was the father of William A. Reynolds II and his wife Judy of Wakefield, and the late Pamela Reynolds. He is also survived by his loving granddaughter, Shae Reynolds. Visiting hours for relatives and friends will be held at the McDonald Funeral Home, 19 Yale Ave, Wakefield on Wednesday June 18th, from 4:00 to 8:00 P.M. A Graveside Service will be held at Oakdale Cemetery in Middleton, MA. on Thursday June 19th at 11:00 A.M.